Small blurb from Goodreads.com: A friend posted a video of me dancing online and now I'm now longer Alicia Ruffino. 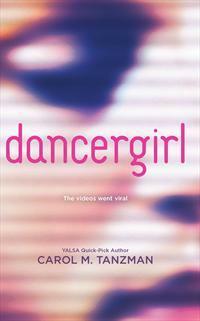 I'm dancergirl—and suddenly it's like me against the world—everyone's got opinions. My admirers want more, the haters hate, my best friend Jacy—even he's acting weird. And some stranger isn't content to just watch anymore. Ali, dancergirl. Whatever you know me as, however you've seen me online, I've trained my whole life to be the best dancer I can be. But if someone watching has their way, I could lose more than just my love of dancing. Teaser from page 52: "I hear the name first. Behind me, in the park. The end of daylight saving time has brought dusk earlier than I expected, so I can't quite see the guy's features. He looks sinister in his long gray trenchcoat."